Trends Reader is an interactive, responsive reading app that brings forth trending topics, fresh blogs, and the hottest articles from around the Web. Reading articles on Trends Reader is a great way to stay up to date about the latest trending topics circulating the web, as well as stay informed about your personal interests. How does Trends Reader work? By first detecting trending topics, and then aggregating related articles, Trends Reader allows Shop Your Way users to easily find interesting, relevant, and practical daily reading material. What can I read on Trends Reader? Trends Reader aggregates all sorts of material ranging from blog posts, informative, articles, How-To tutorials, product reviews, news, trending topics, and much more. You can choose from numerous topic categories such as consumer electronics, food and groceries, beauty, lawn and garden, health and vitamins, outdoor activities, books/music/videos, baby and toddler, fashion, and home appliances, to easily and conveniently read your way across the web. 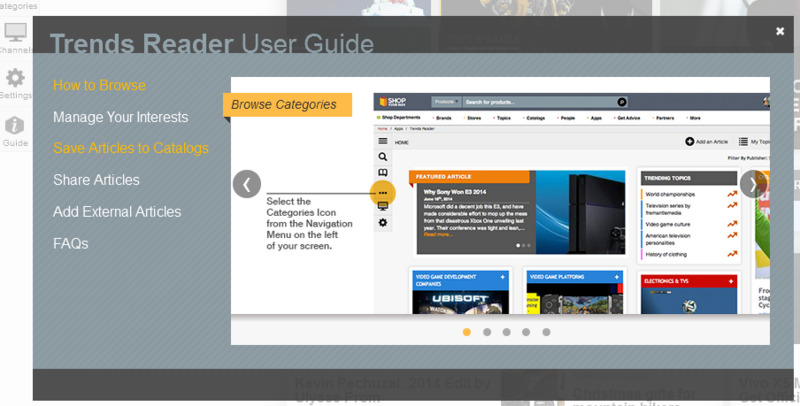 To get started, click on "Explore" from the menu located on the top of the page. 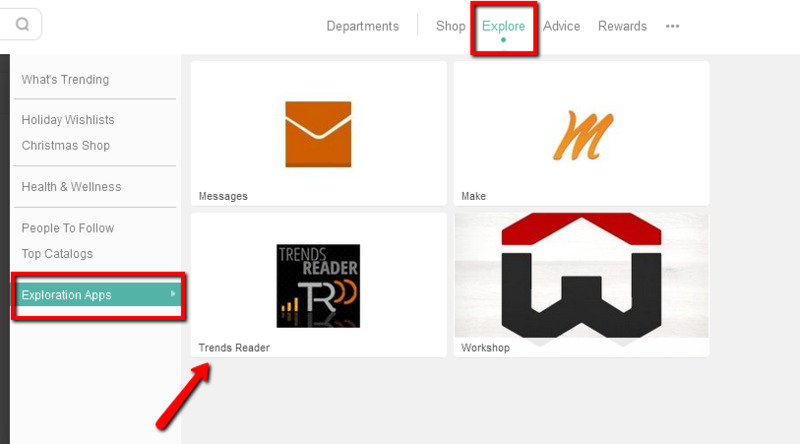 Click on "Exploration apps” and you’ll see Trends Reader along with a number of other apps. You may choose the topics you are most interested in by clicking on "My Topics" button located on the upper right corner and then on "Edit Topics"
By selecting different categories on this list, Trends Reader will be able to start you off with the content that you are most interested in. To get started on Trends Reader, click here. How do I use Trends Reader? You can either browse articles by selecting the categories that interest you, or search for a specific topic in the discovery search bar. To save articles you have read on Trends Reader, when you are on the page of the article, scroll over the left side navigation bar to “Reading List” and click “Add to Reading List.” The article will automatically be saved so that you can easily go back to share, re-read, or refer to the article. You can also delete articles from your reading list by scrolling over the left side navigation bar to “Reading List” and clicking on “View Your Reading List.” You will be brought to all of the articles you saved on your reading list. To delete an article, click the (x) on the bottom left corner of the article preview. 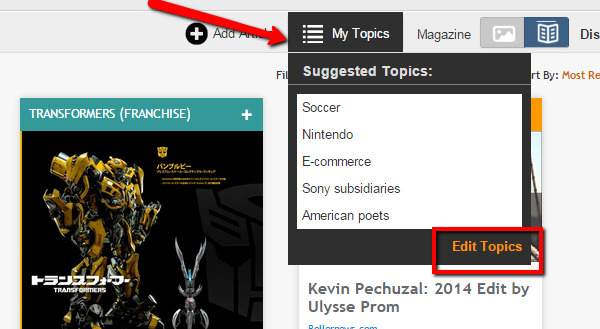 There is also a tab on Trends Reader that allows you to manage the topics you follow. To manage your topics, scroll over the left side navigation bar to “Topics,” click on “View your topic list” on the pop up that appears, and either add (+) or take away (x) topics that you want or don’t want to read about. Along with topics that you already selected, there are two additional lists that present you with suggested topics and the Top Editor’s picks that offer topic ideas so that you can continue expanding your reading and learning. To review an article, click on the “Review” tab on the left side navigation bar. When you do this, a comment box will pop up on your screen. To submit your comment, click on the orange box called “Comment.” Once you do so, you will see a preview of your comment in the yellow box. To share an article that you’ve found on Trends Reader, scroll down to “Share” on the left side navigation bar. 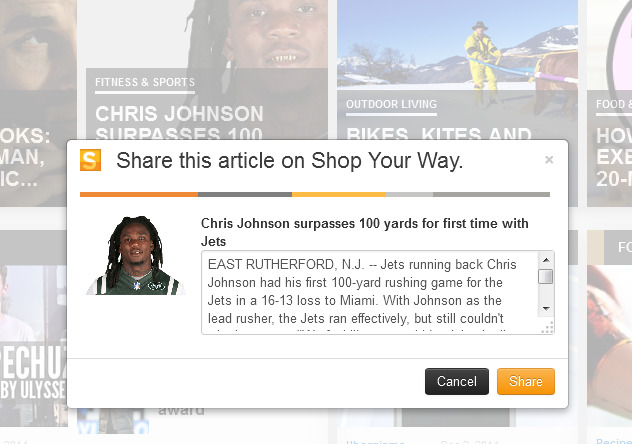 Here a popup will appear allowing you to share the article on Shop Your Way, via email, on Twitter, and on Facebook. You can also click on one of the sharing buttons that are directly on the article. To share an article on Shop Your Way, click on the “Share” tab on the left side navigation bar. When the pop up box appears, click on the orange “S” icon. 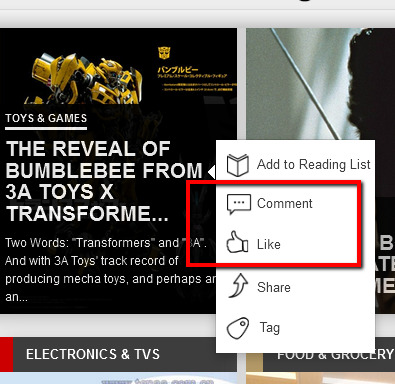 In the next pop up box, you can either leave the suggested text that the article provides, or leave your own comments about the article. When you are finished, click the orange “Share” button to share the article, which will then appear on your newsfeed. To share an article via email, click on the “Share” tab on the left side navigation bar. When the pop up box appears, click on the orange envelope icon. In the next pop up box that appears, insert the email addresses you want to send the article to in the first white box. In the second white box, you can leave a comment for your friends. To send, click the orange “Email” button. To share an article on Twitter or Facebook, click on the “Share” tab on the left side navigation bar. When the pop up box appears, click on either the Twitter icon or Facebook icon, and follow the prompts to share on the article on these forums.